"When you sleep right, you have the best chance at having a good day." 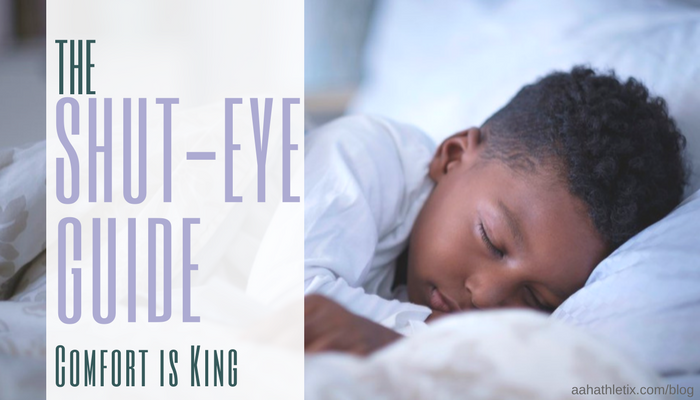 In previous emails, we discussed the importance of knowing when to take naps and for how long, what to eat and we even discussed how to position your body for the best rest. Tonight, in the final part of The Shut-Eye Guide series, we will talk about the ultimate importance of sleep and how comfort plays a role. I have a friend who has battled sleeplessness for most of her life and has tried nearly everything to shake it. Being diagnosed with insomnia has even had an affect on her as well, as she's told me, "Just thinking about sleep makes me frustrated because I know, even after working long days and going to school, tomorrow's gonna be just as hard on me." This is torture--knowing that her health isn't getting the benefit of recovery and relaxation because even mentally, the idea of sleep is dreadful. Upon further research, I would conclude that sleep shouldn't be some thing we do unconsciously, meaning, we should't just fall asleep because those of us who sleep best actually make sleep an event, something to look forward to with a calculated approach. For me, I like to read before I sleep. Yes, my mind can be overstimulated but when I read, the room is silent, and it's the 20 minutes of silence I need to go down easy. Another thing that works for me is meditation. I can sit in the living room in darkness for about 20 minutes and focus on breathing and complete relaxation. Some of use scented oils and incense, or some particular fragrance that calms our souls and relaxes our minds. Combine that with a hot bath after a quick shower and you might fall asleep right in your tub. Think about these things when you're getting ready for bed to see what helps you ease into a deep sleep. Staying at hotels can be a true treat. Having stayed in several hotels of all kinds, truly the only thing worth taking from a hotel is the bed and those fluffy memory foam pillows that you could sink your head into and disappear (only we don't have luggage large enough for it to fit into). Just over a year ago, we took our time investing in a mattress that, I can say, is one of my few life's great accomplishments. This was actually when I began to look-into sleeping and why it's so important... because it felt so good for a change. Count it a blessing if you're no longer excited to sink into your cumulus cloud-like mattress because you're so use to it, but as for me, it's one of the few highlights of my days. If not, if you're sleeping on a pile of wires and cotton, then you should look into investing (not buying) a great mattress and learn the reasons why it is critical for your quality of that third of your life. There's so much to learn about sleep. It would be wrong for me to suggest for you to sleep longer than you need. Sleep is simply a necessary event that should be experienced in luxury only as needed. For all of us, let's make sleep a great part of the day to recharge and wake up for whatever adventure life takes us on each day. Then as we sleep, may we dream about living, and may we live our dreams.